Welcome to Myanmar! Meet your guide at the Mandalay Airport to embark on your highlights tour. Start off in the colorful markets of Mandalay, with markets specializing in food, gems, and traditional handicrafts. 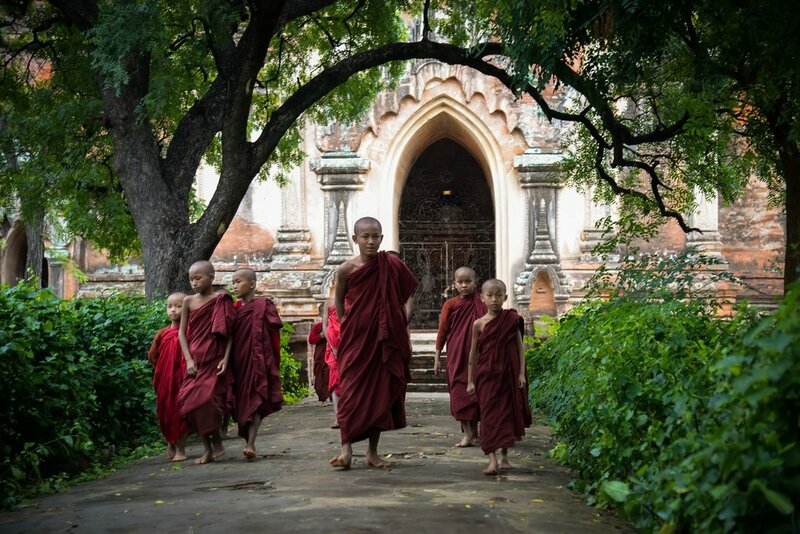 You'll then continue to the next stops on your tour, including the revered Mahamuni Pagoda; a gold-leaf hammering craft shop; the wood carvings of the Shwenandaw Monastery; and the Kuthodaw Pagoda, home of the world's largest book—729 stone slabs containing the entirety of the Buddhist scriptures. 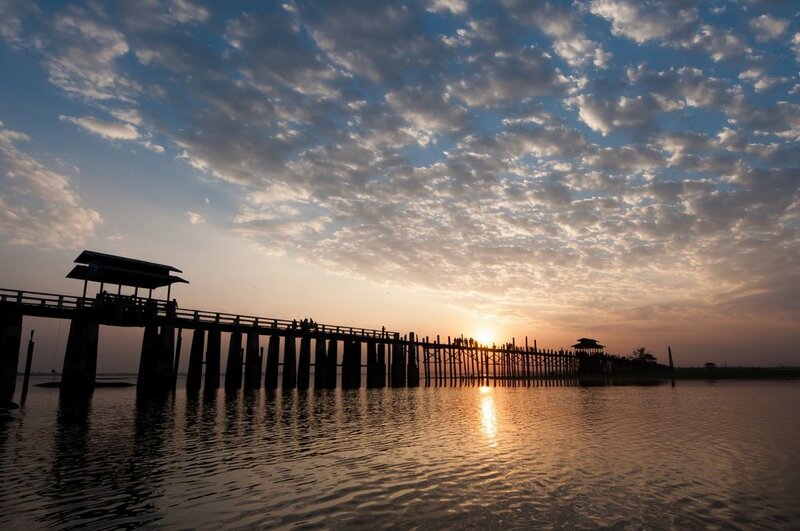 Keep going toward the ancient capital of Amarapura, where you can find the U Bein bridge across Taungthaman Lake. The roughly 1-mile bridge is believed to be the oldest teakwood bridge in the world, built around 1850 with wood reclaimed from the former royal palace in Inwa. Its 1,086 pillars rise out of the water, creating dramatic sunset views. 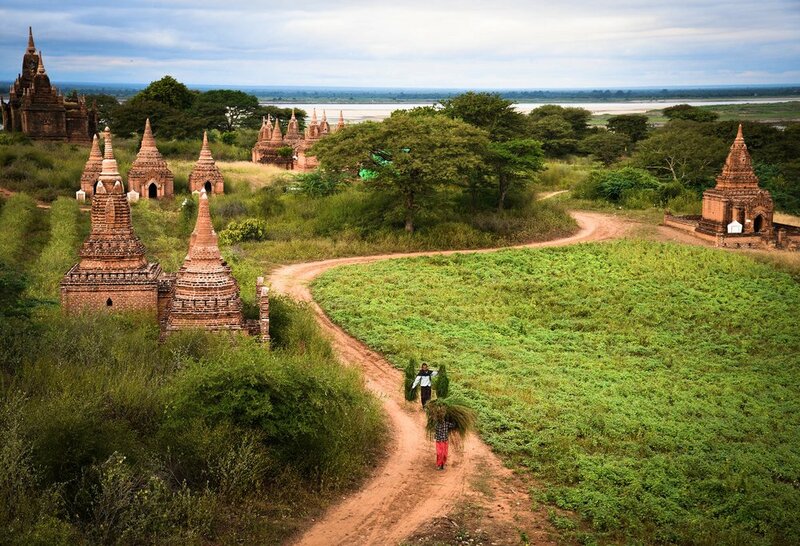 Take a slow boat toward Bagan as you cruise along the Irrawaddy river. You'll board your vessel at Sagaing Lay Kyun Man Aung Jetty in the early afternoon, enjoying lunch onboard as you float down the river. 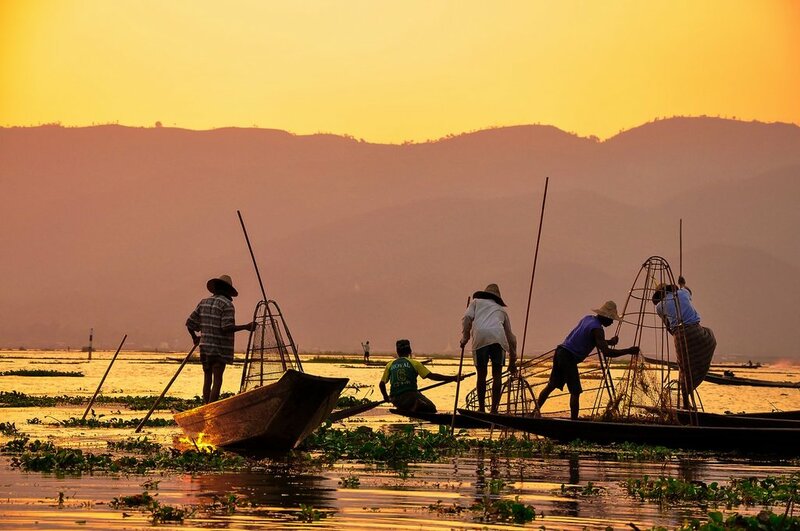 Enjoy culinary demonstrations, longyi pants-wearing, and a thanakha cosmetic demonstration, topped off with a welcome toast and cocktail hour on the upper deck before you drop anchor for the night at Set Pan Gone village. Your second day onboard keeps you going down the river to the Yandabo village, known for its production of terracotta pottery made with clay from the riverbank. Observe the various stages of the pottery-making process and decoration of pots that will be transported by boat around the country, along with a visit to the local school. Hop back on the boat and continue downstream, past the confluence of the Chindwin river. You'll reach Pakokku vilalge in the evening, which is known for its tobacco trade and thanakha cosmetics. Trade your boat for a tuk tuk to visit a tobacco workshop, blanket workshop, and the local market. Return to the boat once again for another night onboard. After your last morning onboard, you'll disembark at Bagan. Explore the ancient city's distinctive pagodas, including Shwezigon, which was the model for many of the stupas around the country, and the famous Ananda Pagoda. You'll also stop to see the frescoes of the 13th century cave temple of Wetkyi-in-Gubyaukgyi; Ananda Ok Kyaung, one of the few surviving brick monastery buildings from the early Bagan period; and Htilominlo Temple, the last Myanmar-style temple built in Bagan. Take a break for lunch before you continue with the temple tour later in the afternoon. 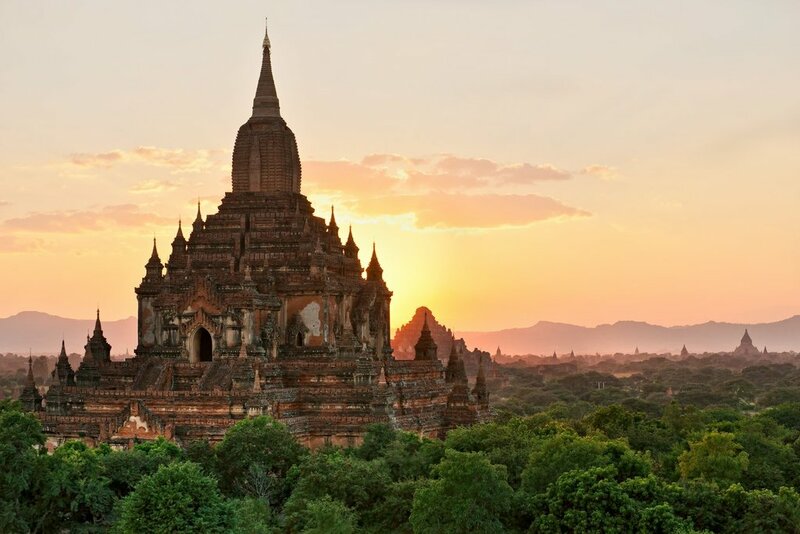 Visit Sulamani Temple, built by King Narapatisithu; the massive later-period Dhammayangyi Temple, with some of the finest brickwork in Bagan; and towering Thatbyinnyu Temple. Your guide will eventually lead you to the best sunset-watching spot to watch evening come in over the temples. 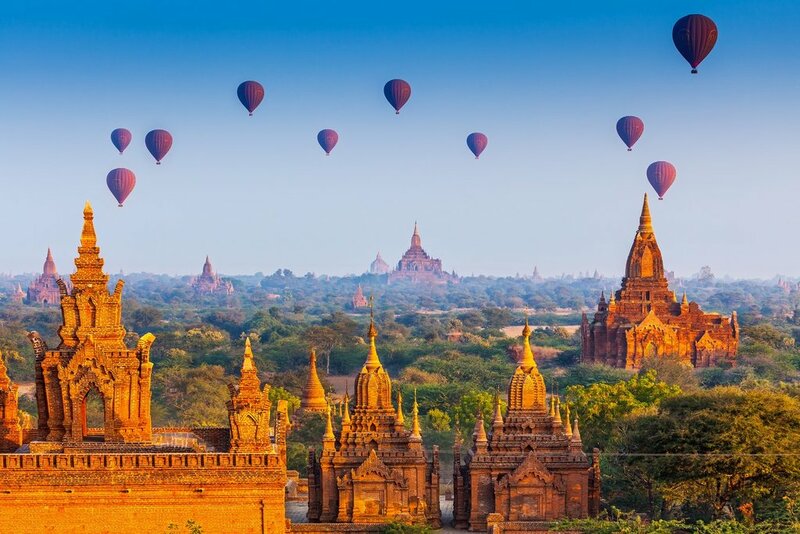 Get up extra early to take flight over the landscape and pagodas of Bagan, considered one of the best hot air balloon destinations you can find. You'll enjoy breakfast as the balloons fill up, then board the basket to soar over the temples, giant trees, and the river at dawn, taking in the panoramic views you can only get from floating high in the air. Once you come back down to earth, you'll toast to your flight with refreshments and be returned to your hotel. Spend the rest of the day exploring at your leisure. Transfer to the Nyaung U airport this morning to fly to Heho, the closest airport to Inle Lake. Once you arrive, you'll board a small long-tail boat toward the Inn Paw Khone village. Visit local lotus and silk-weaving workshops along with traditional boat-making and cheroot cigar-making factories of Nanpan. Continue to the Phaung Daw U Pagoda, the area's most revered monastery, and its five ancient gold leaf Buddhas. Then end your day at the floating gardens of the Nge Phe Chaung monastery. 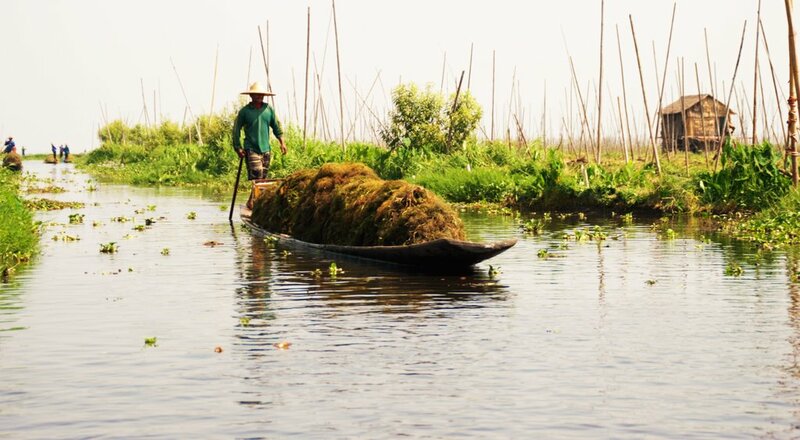 Take it easy with a full day on your own to explore the unique beauty of the Inle Lake landscape. In the morning, transfer to airport to take the flight to Yangon. 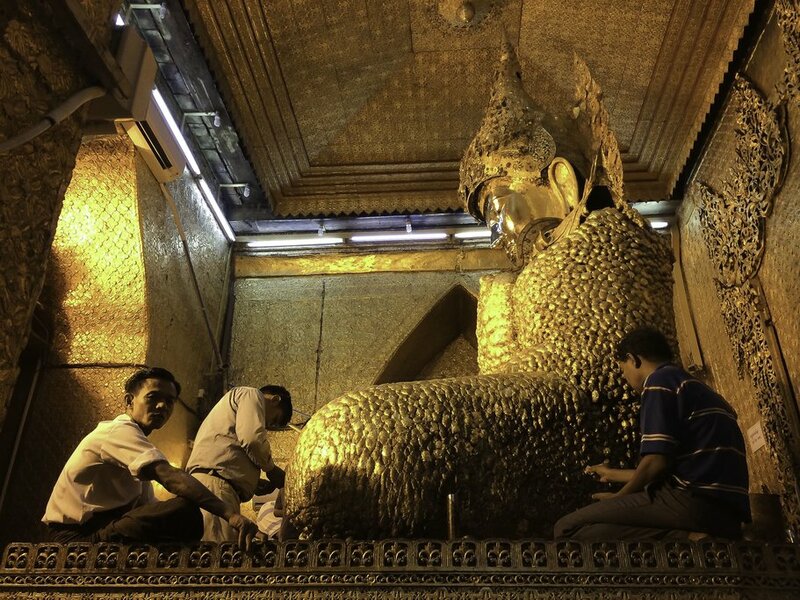 After you've dropped off your luggage at your lodging, you'll head out to see some of the city's highlights, including the Reclining Buddha at Chauk Htet Gyi popular with Buddhist worshippers and the artifacts of the National Museum. Head downtown to check out the remaining British colonial architecture and the long boulevard of Pansodan Street, best known for its streetside book stalls. In the evening, browse for crafts at the Bogyoke Aung San Market. Built in 1926, the stone streets of this bazaar are still a popular tourist destination for their rows of antique handicrafts, jewelry, art galleries, and clothing stores. 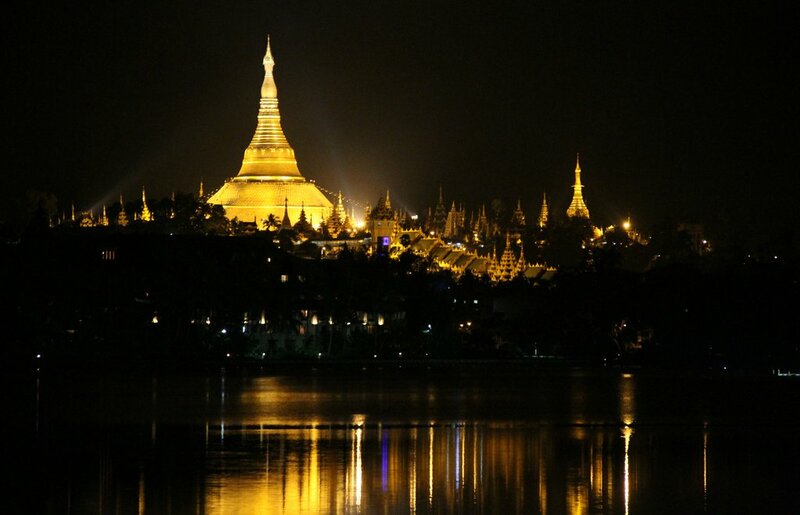 Top it all of with a visit to the Shwedagon Pagoda, the most important religious structure in Myanmar and a point of pilgrimage for Buddhists across the globe. 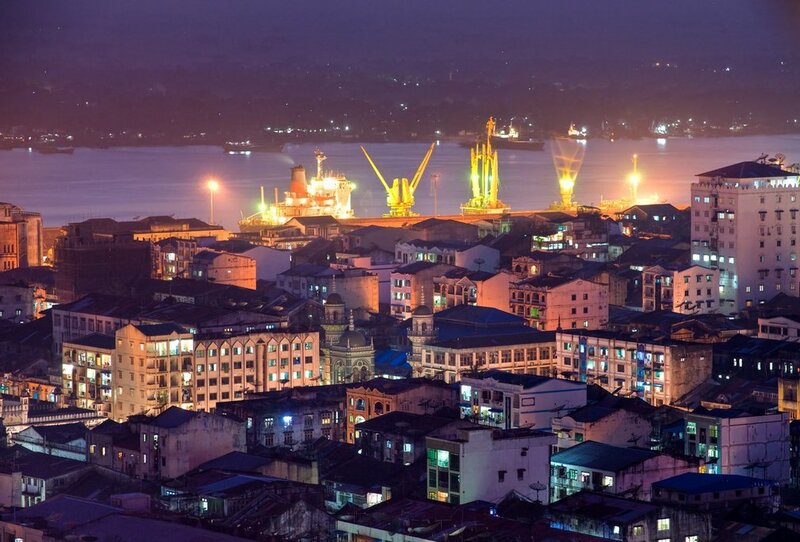 Return to Yangon Airport to return home or continue onward to your next adventure.